・It bridges left and right suspension arm’s mounting points together so as to prevent suspension member from twisting, thus wheel alignment keeps straight. 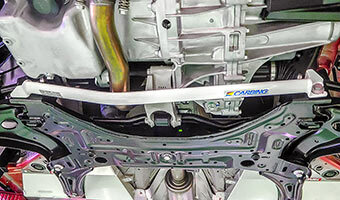 ・This product connects left and right rear suspension to control excess movement of the rear suspension under load. ・Made of steel. White color powder coated paint for scratch registants. ・Okuyama Lower Arm Bar uses 20x40(mm) oval shaft for better torsion rigidity.